Two of my best friends graduated college this weekend & I got a mother's day card from my dog! So we're doing pretty great today, ya know, aside from the quarter-life crisis. Can those even exist before you hit 25? Unfortunately tiny Kae didn't take into consideration all the less than glam stuff like taxes and finding a job and resisting the urge to buy the entire Target inventory. Who knew? Anyway. Back to the question. I think I've figured out the answer to it too. Besides wanting to be Alexa Chung, I DON'T KNOW. I have no idea what I'm doing. I know that I love this little space I've created & that I want to keep it & let it grow. Maybe that's all I need right now and I'm trying to be ok with the fact that I, in fact, don't have everything figured out. Luckily I don't think you have to know exactly where you're going or what you're doing at any certain time. We're all just faking it, yay! 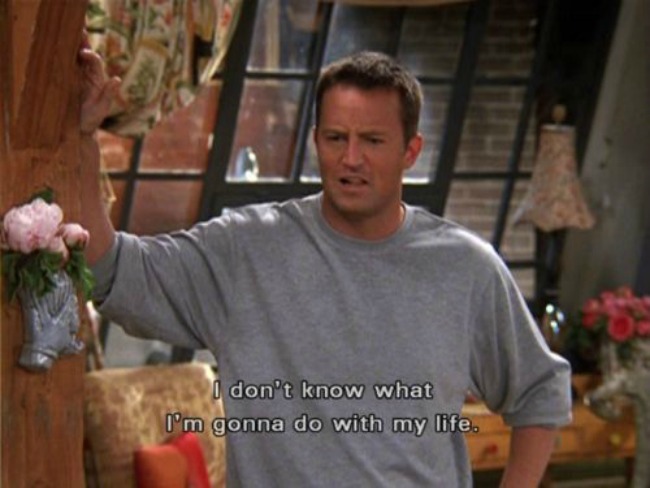 But seriously folks, if you're Chandler Bing-ing it out, it's okay. PS I'm seriously reconsidering this post's post-worthiness, but too late for cold feet!